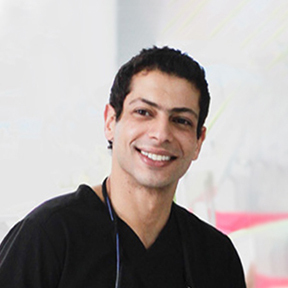 Dr. Sherif Said received his degree in Bachelor of Dental Surgery (BDS) and Advanced Education General Dentistry (AEGD) training from the University of Modern Sciences and Arts in Cairo, Egypt in 2012. Following his graduation, he accepted a faculty position in the Department of Oral and Maxillofacial Surgery. In 2013, Dr. Said completed his Periodontics fellowship program at Case Western Reserve University in Cleveland, Ohio. He then went on to Boston University to begin his post-doctoral training, pursuing both a Master of Science in Dentistry (MSD) and Certificate of Advanced Graduate Studies (CAGS) in Periodontology with a special focus on growth factors and peri-implant tissue development. Dr. Said is both a diplomate of the American Board of Periodontology and fellow of the Royal Colleges of Dentists of Canada. To maintain his teaching and research interests, Dr. Said currently maintains a clinical assistant Professor position in the Post-doctoral Periodontology department at Boston University. Dr. Said lectures both locally and internationally while maintaining both a private practice and in academia in the fields of Periodontics & Implant Reconstructive Dentistry.